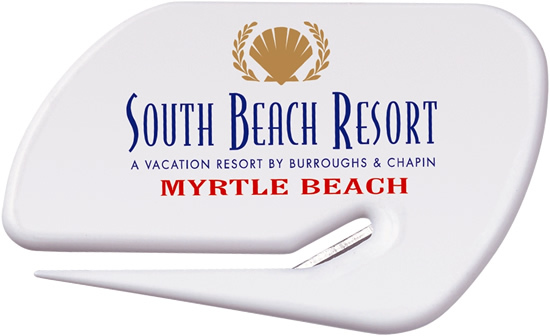 Letter opener for business advertising that offers a larger imprint area for promotion. Letter opener features are quality plastic construction and a razor sharp blade. Optional magnet permanently adhered to the back add $.12 each. Overall size of the letter opener is 2 15/16" w x 1 7/8" h.
Each unit is poly bagged, bulk packed in carton. Price includes a one color imprint one side in area 2 1/8" w x 3/4" h.
or 2nd side one color imprint add a setup and $.30 each. Logo requires Illustrator ai, eps or pdf art file.